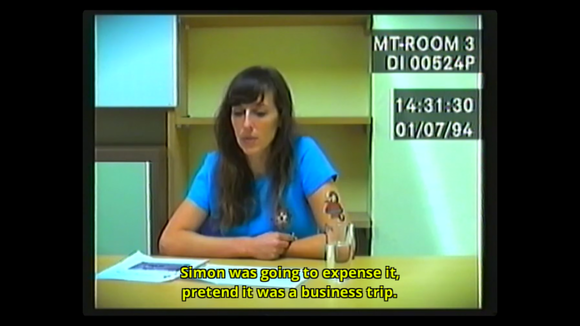 Her Story is an interactive narrative game that uses video clips, an open-ended search engine, and non-linear storytelling to give players a completely unique experience. Another tape. This time the date stamp says July 3, 1994. The same woman. But now she’s wearing a white blouse and referring to herself in the third person. What’s going on? In Her Story, an interactive narrative mystery game, your job is to find out. This premium title costs $5, but it’s definitely worth it—Her Story is unlike any game you’ve ever played. You play as an anonymous user looking through old interview tapes from a murder case in 1994. Although the game is a narrative, it’s not linear—the order you see the tapes in will depend on how you decide to go about “solving” the case. You’re presented with a search box that lets you search through transcripts…and little else. Time to get to work! You’ll feel like a real detective: In Her Story, your character’s identity is never fully revealed. You’re logged into the L.O.G.I.C. Database of the South East Constabulary as AUTH_GUEST, thanks to an anonymous inside contact (‘SB’). The entire game takes place on this old PC, which is hooked up to a CRT monitor by the looks of the glare reflecting off the screen. Your job is to sift through hundreds—approximately 271—of video clips from seven different 1994 interviews. The clips are unorganized, but have been transcribed so you can search for words using a free-input search box. When you start the game, the first search term (which yields four clips) has already been typed in for you: MURDER. If the CRT-like glare is too much for you, you can turn it off in the settings. And this is where it gets interesting. Unlike other mystery games—or other games, for that matter—there are few instructions on how you’re meant to proceed. A readme file reveals basic search tips, but no information on what terms you ought to try or what visual clues you should be looking for. The game offers a handful of organizational tools: You can add keywords to clips for future reference, and save important clips to your user session. But aside from these tools, solving this mystery is entirely up to your detective skills. The writing is spot-on: Her Story was developed by Sam Barlow—of Silent Hill: Shattered Memories fame—so it’s probably not surprising that the script is well-written, unsettlingly realistic, and dark. I mean, you knew it was going to be kind of dark, because it’s a murder mystery, after all. But trust me—the narrative gets pretty weird, while still managing to stay well within the realm of believability. Expensing things, business trips? Not every clip in Her Story is dark. Her Story isn’t just an interesting (and dark) narrative, though—it’s written in a way that manages to give you answers while still being open for interpretation. There were many times during my play-through that I would watch a clip and think Ahh, it all makes sense now, only to watch a different clip and be forced to re-evaluate my previous conclusion. The writing makes Her Story a deeply personal experience, because it uses your own feelings and assumptions to fuel its narrative. It’s completely unique: Her Story has no definitive ending. Somewhere near the middle of the game, you’ll receive a chat message from your inside contact, asking if you’re finished using the database. You can reply ‘yes’ or ‘no’ to this query—depending on whether you feel like you’ve found out what you need to know. If you respond ‘yes,’ your contact will ask you to log off and meet them outside; if you respond ‘no,’ your contact will ask you to give them a call (send them a chat message) once you’re done. 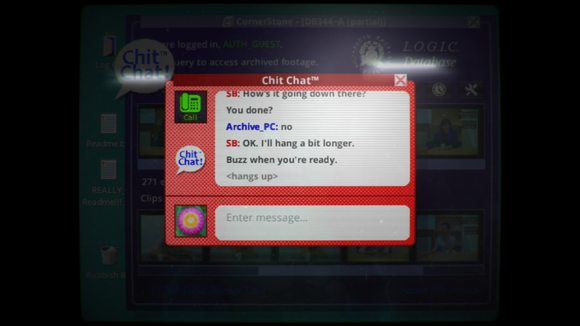 When you’re ready to log off, simply call up your contact on the Chit Chat window. But Her Story is all about how you feel. If you believe you know all you need to know before you make it through half the tapes, so be it—you can log off, end the game, and whatever conclusion you’ve come to is, well, your ending. If you feel like you need to see more tapes, keep watching until you feel satisfied. 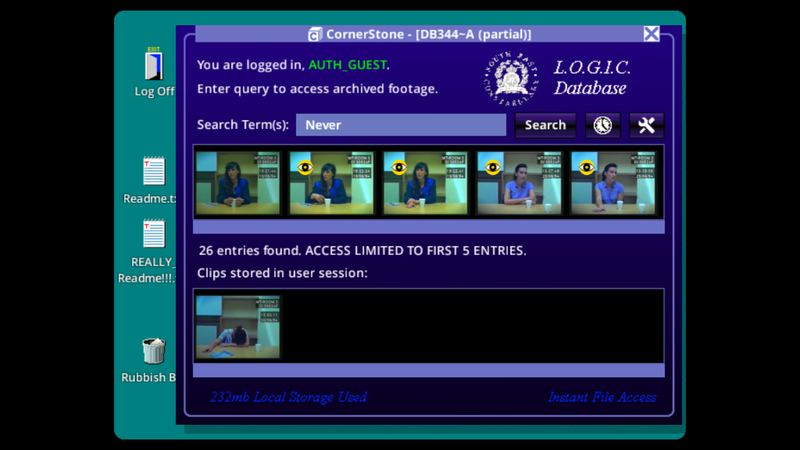 If you’re not sure how many tapes you’ve waded through, you’ll find a database checker on the desktop. No two people will have the same experience playing Her Story, because the experience depends on how you search, in what order you watch the tapes, how many tapes you watch, and what conclusions you want to draw.